Researchers analyze global potential for 'negative emissions energy' using electricity from renewable sources to generate hydrogen fuel and capture carbon dioxide. "It not only reduces atmospheric carbon dioxide, it also adds alkalinity to the ocean, so it's a two-pronged benefit," Rau said. "The process simply converts carbon dioxide into a dissolved mineral bicarbonate, which is already abundant in the ocean and helps counter acidification." The negative emissions approach that has received the most attention so far is known as "biomass energy plus carbon capture and storage" (BECCS). This involves growing trees or other bioenergy crops (which absorb carbon dioxide as they grow), burning the biomass as fuel for power plants, capturing the emissions, and burying the concentrated carbon dioxide underground. "BECCS is expensive and energetically costly. We think this electrochemical process of hydrogen generation provides a more efficient and higher capacity way of generating energy with negative emissions," Rau said. "The issues are how to supply enough biomass and the cost and risk associated with putting concentrated carbon dioxide in the ground and hoping it stays there," Rau said. The electrogeochemical methods have been demonstrated in the laboratory, but more research is needed to scale them up. The technology would probably be limited to sites on the coast or offshore with access to saltwater, abundant renewable energy, and minerals. Coauthor Heather Willauer at the U.S. Naval Research Laboratory leads the most advanced project of this type, an electrolytic-cation exchange module designed to produce hydrogen and remove carbon dioxide through electrolysis of seawater. Instead of then combining the carbon dioxide and hydrogen to make hydrocarbon fuels (the Navy's primary interest), the process could be modified to transform and store the carbon dioxide as ocean bicarbonate, thus achieving negative emissions. "It's early days in negative emissions technology, and we need to keep an open mind about what options might emerge," Rau said. "We also need policies that will foster the emergence of these technologies." In addition to Rau and Willauer, coauthor Zhiyong Jason Ren at the University of Colorado in Boulder (now at Princeton University) also contributed to the paper. This work was supported by Lawrence Livermore National Laboratory, Office of Naval Research, and National Science Foundation. • The global potential for converting renewable electricity to negative-CO2-emissions hydrogen, by Greg H. Rau, Heather D. Willauer, Zhiyong Jason Ren. 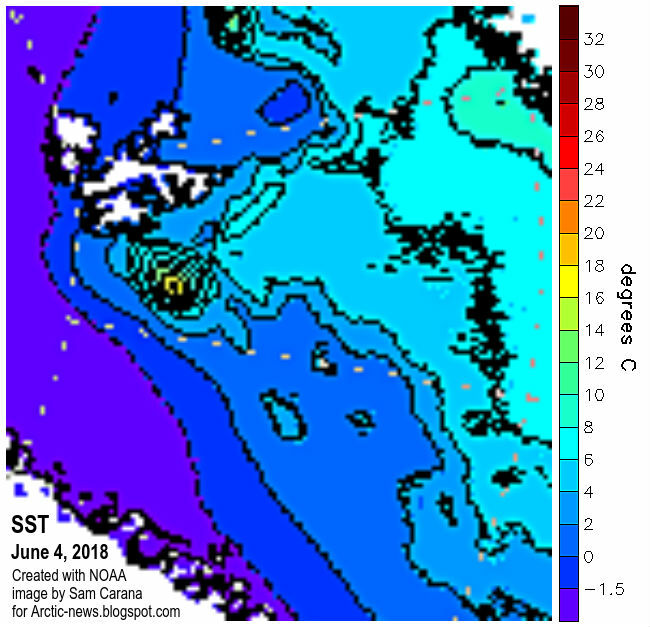 It was 6.6°C or 44°F (at 850 hPa) over the North Pole due to hot air flowing from Siberia over the Arctic Ocean on June 13, 2018, 15:00 UTC (left panel). Earlier, temperatures as high as 7°C or 44.5°F were forecast. At the same time, the Jet stream (250 hPa) crosses the Arctic Ocean and goes circular over North Canada and Baffin Bay (right panel). As the combination image below shows, it was as hot as 32.7°C or 90.9°F (left panel, at the green circle) on June 11, 2018, on the coast of Hudson Bay. The right panel shows the jet stream crossing the Arctic, while numerous cyclones are visible on both images. The combination image below shows that it was as hot as 30.7°C or 87.3°F (at the green circle, left panel) on the coast of the Laptev Sea, on June 10, 2018. The right panel shows the jet stream crossing the Arctic at speeds as fast as 161 km/h or 100 mph (at the green circle). 1. 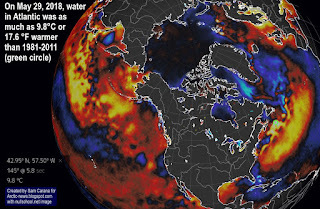 Heat is reaching the Arctic Ocean directly, i.e. air is warming up the water of the Arctic Ocean or is melting the sea ice from above. 2. Rivers that end in the Arctic Ocean can carry huge amounts of heat. 3. Heat is also entering the Arctic Ocean from the Atlantic Ocean and the Pacific Ocean. 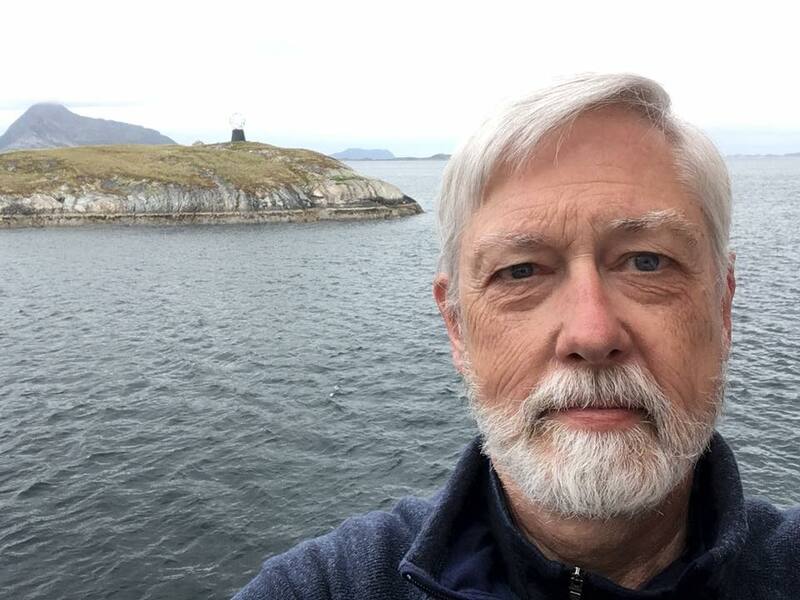 Feedbacks, such as changes to the jet stream, can further speed up warming of the Arctic Ocean. As the Arctic warms up faster than the rest of the world, the temperature difference between the Arctic and the Equator decreases, making the Jet Stream wavier, with longer loops that allow more warm air to enter the Arctic and at the same time allow more cold air to flow out of the Arctic (feedback #10 on the feedbacks page). 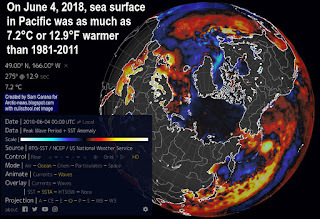 The top image on the right shows that the sea surface in the Atlantic Ocean off the coast of North America on May 29, 2018, was as much as 9.8°C or 17.6°F warmer than 1981-2011 (at the green circle). 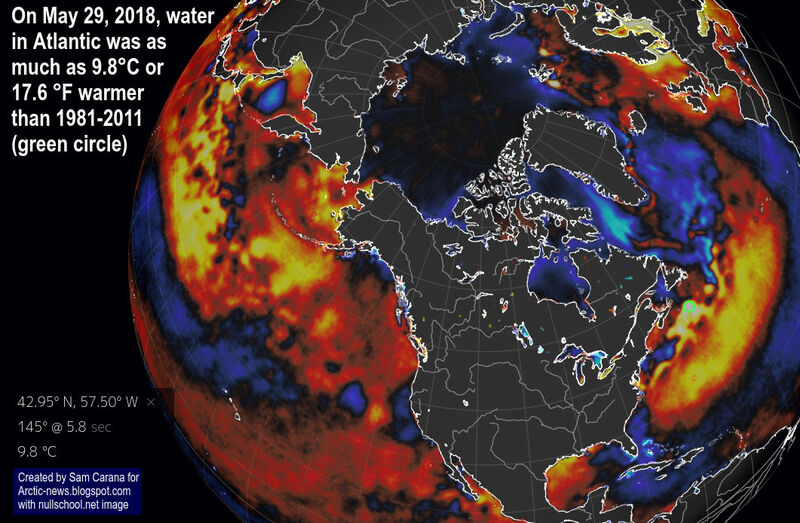 As temperatures keep rising, increasingly stronger winds over oceans are also causing more heat to enter the Arctic Ocean from the North Atlantic, and from the Pacific Ocean. On June 4, 2018, the sea surface in the Pacific Ocean near Bering Strait was as much as 7.2°C or 12.9°F warmer than 1981-2011 (at the green circle), as the next image on the right shows. The next image on the right shows that water near Svalbard was as warm as 16.1°C or 61°F on June 4, 2018, versus 3°C or 37.4°F in 1981-2011 (at the green circle). 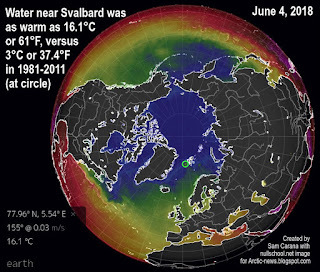 On June 4, 2018, sea surface temperature near Svalbard was as warm as indicated by the color yellow on the image on the right, i.e. 16-18°C or 60.8-64.4°F. 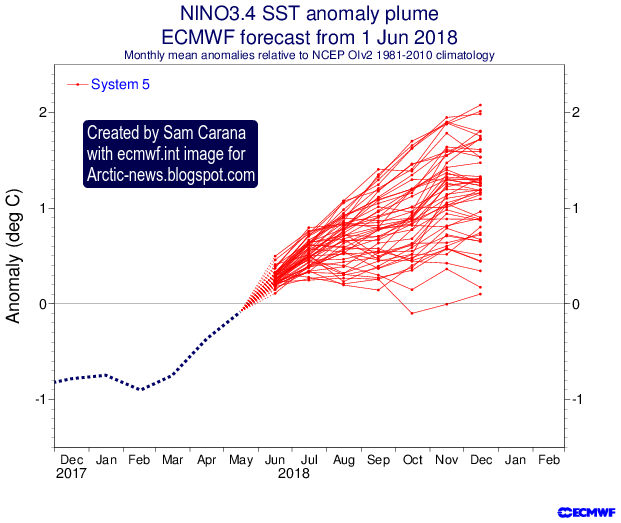 For more background on the warm water near Svalbard, also see the earlier post Accelerating Warming of the Arctic Ocean. This heat will warm up the water underneath the sea ice, thus melting the sea ice from below. Furthermore, as the sea ice retreats, more sunlight will be absorbed by the Arctic Ocean, instead of being reflected back into space, thus further speeding up sea ice decline. 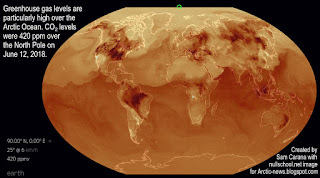 Oceans take up over 90% of global warming, as illustrated by above image. Ocean currents make that huge amounts of this heat are entering the Arctic Ocean from the Pacific Ocean and the Atlantic Ocean. The right-hand panel of the image below shows the extent of the permafrost on the Northern Hemisphere. The subsea permafrost north of Siberia is prone to melting due to the increasingly higher temperatures of the water. Increasingly high air temperatures are melting the sea ice and, where the sea ice is gone, they are warming up the water directly. High air temperatures are also warming up the water from rivers flowing into the Arctic Ocean, as illustrated by the left panel of above image. On June 15, 2018, it was as warm as 31.5°C or 88.6°F at 06:00 UTC and 31.7°C or 89.1°F at 09:00 UTC over the Kotuy/Khatanga River that ends in the Laptev Sea in the Arctic Ocean (green circle). On June 20, 2018, it was even warmer, as the image on the right shows. 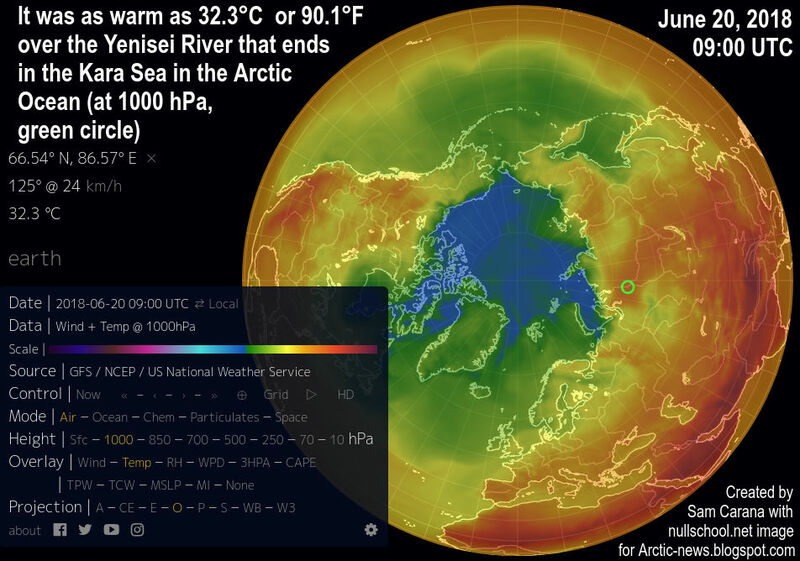 It was as warm as 32.3°C or 90.1°F at 1000 hPa over the Yenisei River that ends in the Kara Sea in the Arctic Ocean (green circle). It was actually even warmer at surface level, but just look at the temperatures on the image over Greenland and the Tibetan Plateau at 1000 hPa. See also this post. As the water of the Arctic Ocean keeps warming, the danger increases that methane hydrates at the bottom of the Arctic Ocean will destabilize. - 2899 ppb on May 04, 2018, a.m.
- 2498 ppb on May 16, 2018, p.m.
- 2820 ppb on May 21, 2018, a.m.
- 2616 ppb on May 22, 2018, p.m.
- 3006 ppb on May 27, 2018, p.m.
- 2878 ppb on June 05, 2018, p.m.
- 2605 ppb on June 07, 2018, a.m. 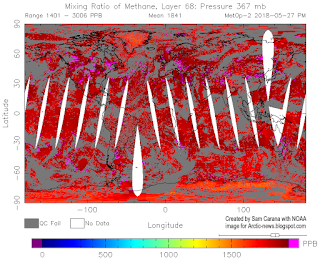 Mean global methane level was as high as 1880 ppb on June 15, 2018, at 254 mb, further confirming that more methane is increasingly accumulating at greater heights in the atmosphere. 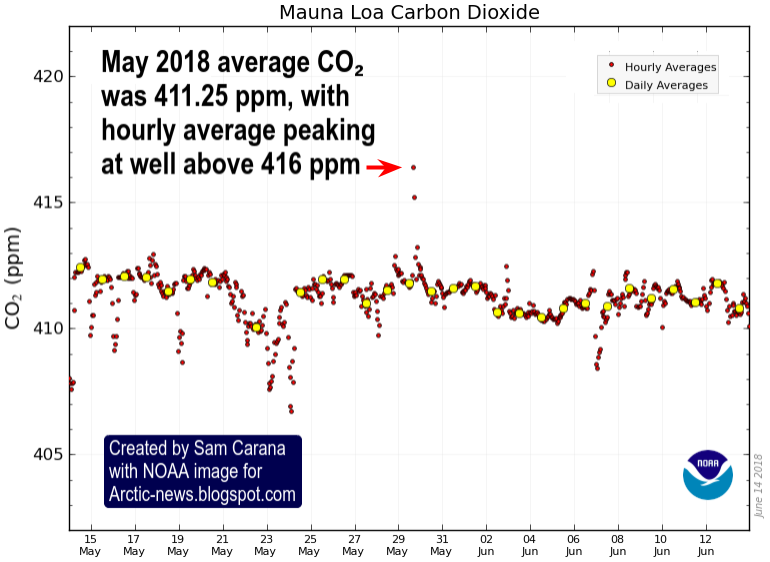 NOAA records show that the average May 2018 CO₂ level was 411.25 ppm at Mauna Loa, Hawaii, while the hourly average peaked at well above 416 ppm. 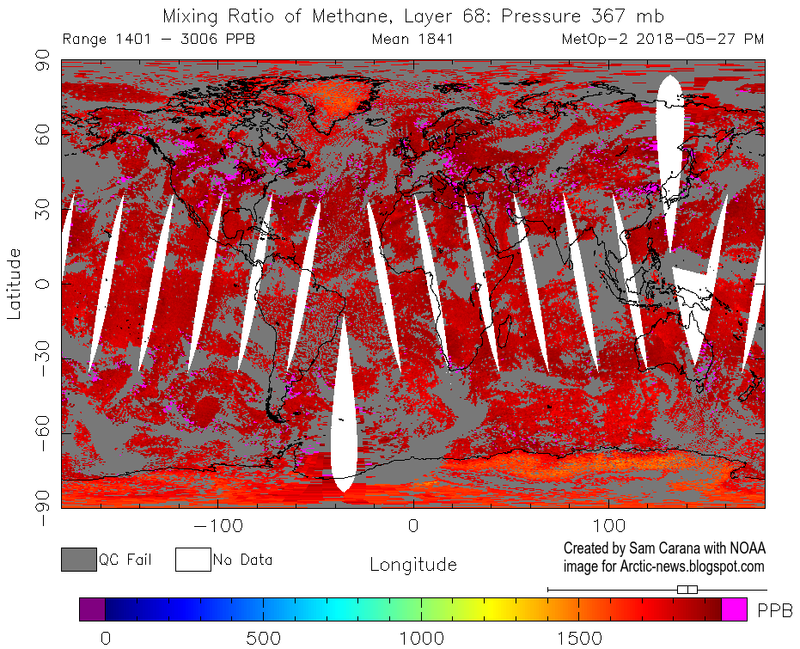 "CO₂ levels are continuing to grow at an all-time record rate because burning of coal, oil, and natural gas have also been at record high levels,” said Pieter Tans, lead scientist of NOAA's Global Greenhouse Gas Reference Network in a news release. "Today's emissions will still be trapping heat in the atmosphere thousands of years from now." Greenhouse gas levels are particularly high over the Arctic Ocean. CO₂ levels were 420 ppm over the North Pole on June 12, 2018. The situation is getting even more critical as we've left the La Niña period behind and are now moving into an El Niño period, as illustrated by the images on the right and below. 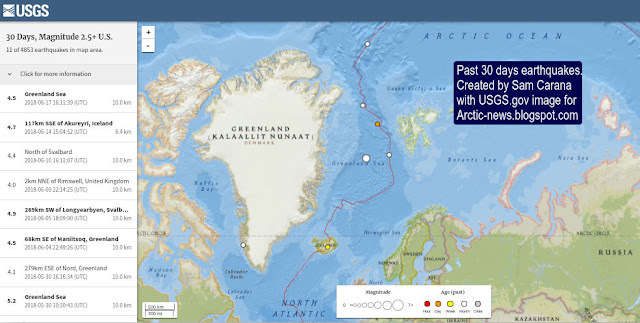 A further danger is that earthquakes can be triggered as more ice is melting on Greenland, as discussed earlier in posts such as this one and this one. Earthquakes can send out strong tremors through the sediment and shock waves through the water, which can trigger further earthquakes, landslides and destabilization of methane hydrates. The situation is especially dangerous when combined with extreme weather events that can cause cracks and movement in sediments. The image below shows earthquakes that hit the seas around Greenland between May 30, 2018, and June 17, 2018. Given the above, it's amazing that the IPCC in its 'final draft 1.5°C report' insists that "If emissions continue at their present rate, human-induced warming will exceed 1.5°C by around 2040" (according to a recent Reuters report). The final draft is now going to governments for their scrutiny, with the danger that the dire situation may be watered down even further. Governments should be urged to confirm that temperatures could rise dramatically over the next few years. Accordingly, comprehensive and effective action needs to be taken, as described at the Climate Plan page.